mangobananas studios is located in West Windsor, VT, in a beautiful setting of rolling hills overlooking Mount Ascutney. 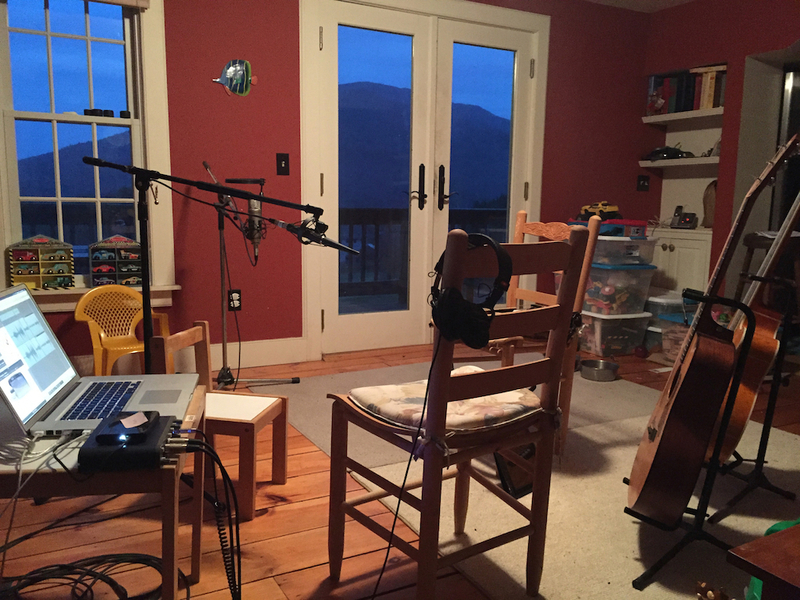 We have several recording locations on the property: The Playroom (above) is upstairs in the house, in a large, open playroom, about 14x18 feet, with stunning views of the mountain. The Cave is an 11x11 foot finished room in the lowest floor of the house, a walk-out basement. There's a window with a great view of the mountain, a stand-up desk, several sets of studio monitors, a large control surface, and walls hung with guitars. It's suitable for one or two musicians, and is usually wired to go for recording piano, acoustic guitar, vocals, or electric guitars on a moment's notice. Just outside the door is an antique cabinet grand piano, and a pool table, in a semi-finished section of the basement with a sliding glass door out to the back yard, hot tub, and swimming pool. The Barn is the second and third floors of a 30x40 foot barn, both unfinished, unheated, but huge, open spaces capable of hosting dozens of players and an audience. There is a finished 10x12 foot room in the corner of the third floor that could be used as a control room. I've recorded a local band on the second floor, which has some windows toward the mountain. The first floor has some chickens! The house and barn are situated on 4 acres of mostly open pastures, with a small fruit-tree orchard, an 18x36 swimming pool with diving board (seasonally), and a Jacuzzi hot tub (year-round). Don't you want to be the first band to record by this awesome pool? We also do remote recording, using the same laptop-based recording rig that we move between recording spaces around mangobananas studios, depending on the situation. We have a small stereo rig as well as a rig capable of up to 26 independently-recorded inputs. We're not a full-time, professional operation. We do this more as a personal passion with a circle of friends. But we're open to discussing a recording project with you. Check out info on our gear, photos, and more below.